NORTH PHILADELPHIA (WPVI) -- Funeral arrangements have been announced for the firefighter who died in the line of the duty over the weekend in North Philadelphia. Lt. Matthew LeTourneau died while battling a fire on the 2200 block of N. Colorado Street on Saturday. Two public viewings will be held at the Cathedral Basilica of Saints Peter and Paul, followed by a funeral Mass. The Cathedral is located at 18th Street & Benjamin Franklin Parkway in Philadelphia. Thursday, Jan. 11: 4:30 to 9 p.m.
Friday, Jan. 12: 9 a.m.
Friday, Jan. 12: 11 a.m.
Interment will follow at Saints Peter and Paul Cemetery in Springfield, Pa. Arrangements by the O'Leary Funeral Home in Springfield. Meanwhile, Gov. Tom Wolf has ordered Pennsylvania flags to be flown at half-staff this week in LeTourneau's honor. The tribute will begin at sunrise on Tuesday and will continue until Saturday, Jan. 13. The order covers flags being flown at the Capitol complex and all commonwealth facilities. "I urge all Pennsylvanians to join me in keeping his family, his colleagues and all our first responders in your thoughts. His sacrifice for his fellow citizens will not be forgotten," Governor Wolf said in a statement. 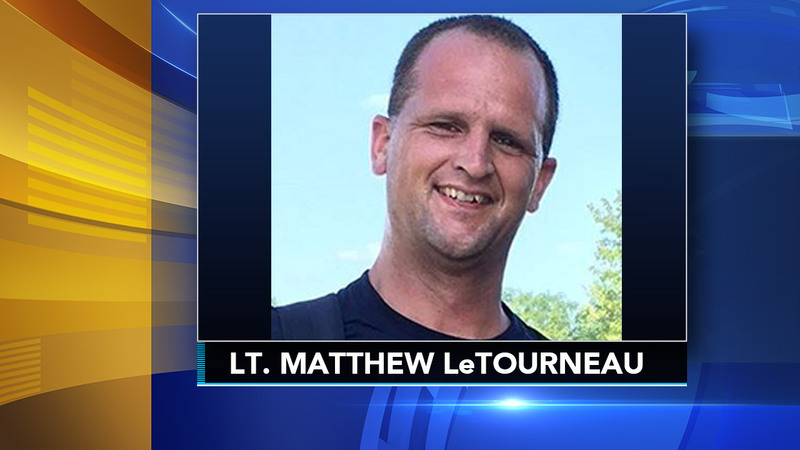 Lt. LeTourneau was an 11-year veteran of the Philadelphia Fire Department, where he was promoted to lieutenant in 2015. He received a unit citation in 2010 and a letter of commendation for his service during the World Meeting of Families in 2015. He was a 1993 graduate of Cardinal O'Hara High School and held an associate's degree in fire science from Delaware County Community College. He lived in Springfield and is survived by his mother, other relatives and friends.